You are SO LUCKY. Wild turkeys?!?! What can I say? Turkeys own all. 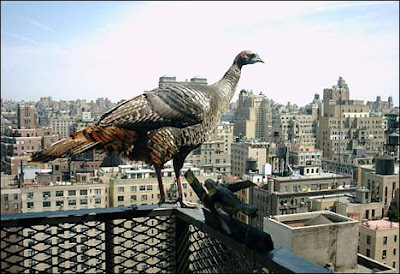 We don't have turkeys in Chicago. wondering if they have been spotted in the shadow city??? woulden't we all like to know? Wild Turkies are MUCH smarter than tamed ones, by the way! So maybe they are smart enough to love big tall buildings and such! I have NEVER seen a wild turkey, even on vacation in the woods. I've read that hawks and birds like that live in cities, because the skyscrapers are like cliffs and stuff. I wonder if pigeons taste good? I've never seen a wild turkey either. John and my mom have seen one at this school though... all these kids pointing at the turkey John says. thats odd. my completelly derogatory commenting, gotta love it. Happy (belated) Turkey day everyone! Patsee: Maybe not, but you have coyotes. Anonymous: Do you think a turkey could make it past the rats? Hazel: I've never eaten a pigeon. But lots of people do. They just choose to call them squab. My sister is to tired with flew (the real throw up, no one can come into your bedroom for like ever type!) to post so I am her and me. We are talking via e-mail, paper-air-planes and coded giberish. She says Happy Turkey Day! I say, why in the world would you want to eat a bird?! Tell Wild to get better!